In this issue of Paranormal Underground magazine, we spotlight near-death experience researcher Lynn K. Russell and paranormal fiction author Cristina Rayne. In our Case Files of the Unknown, we feature eight haunted libraries, the legend of Die Glocke, and the possession of Esther Cox. And, we also take a look at why your house is probably haunted, using tarot cards to talk to the dead, how to make your affirmations more effective, and the mystery in the pods. Also in this issue, we take a look at one couple who lived with a ghost named Belinda, dream interpretations, creepy clowns, and dream magic. Plus, we discuss how to reconnect with yourself again and learn about the lost lizard people of LA. And don’t miss our Equipment Update on three smartphone spirit apps. 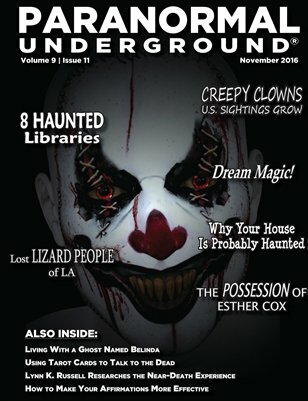 For a 12-month digital (PDF) subscription to Paranormal Underground magazine, visit www.paranormalunderground.net!